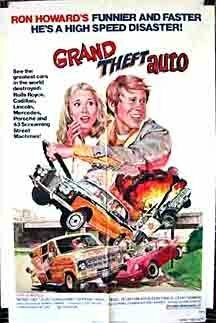 • When Roger Corman was testing titles for Eat My Dust, Grand Theft Auto came a close second as a possible title. So when making a follow up he decided to call it Grand Theft Auto. • The film was made on a budget of $602,000. It was filmed in and around Victorville, California. Roger Corman worked as an executive producer, along with Rance Howard, who also co-wrote the script with Ron. • The film was a commercial success, earning over $15 million at the box office, but critical reception was more mixed. • The first film to be shown three times in one day on HBO (shortly after HBO began broadcasting 24 hours). • Financed by Roger Corman in exchange for Ron Howard appearing in Eat My Dust (1976). • Filmed in only 15 days. • Ron Howard asked Roger Corman to hire more extras for the crowd scene at the end of the film. Corman said no because he did not want to go over budget. • As a promotion for this movie, 16 magazine ran a contest and the winner received a trip to Hollywood and a bit part in the film. Her name was Caryn and she was the girl who catches the bouquet at Paula and Sam's wedding. • Two Rolls-Royce cars were used in this film. • All the scenes on the L.A. freeways were shot without permits. • Ron Howard's wife Cheryl Howard did the catering on this film. • Ron Howard lost 10-12 pounds during the shooting of this movie. • The sequence with the pickup truck and the dynamite was added in post-production. • The demolition derby sequence was done in a single day. • This is Ron Howard's only starring role in a film that he directed. This movie is a selection of the Shut Up And Drive! club. Shut Up And Drive! will be screening this film tonight (Friday, June 10) at 9:00 pm ET. Click Here To Watch.